The communication agency LOOK UP in Gelsenkirchen, Germany, desired a building with a high recognition value, a building with a self-confident and progressive expression symbolizing through its purity the working methods of the agency. The building site is situated on a revitalized former colliery field. The building is three-story high without basement and houses two separate areas. “Production” is on ground floor – here, finishing of LOOK UP products takes place. The “creative zones” as well as conference rooms and management are located on both upper floors. 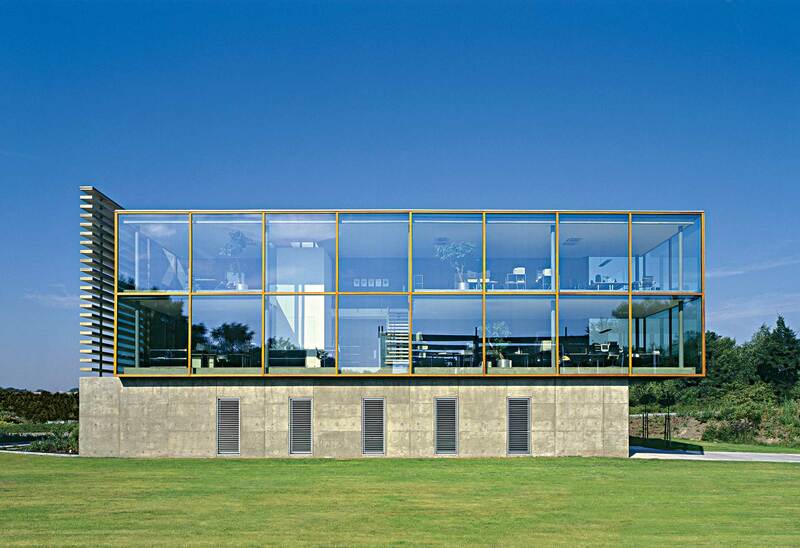 Those floors are realized as open, transparent work area. 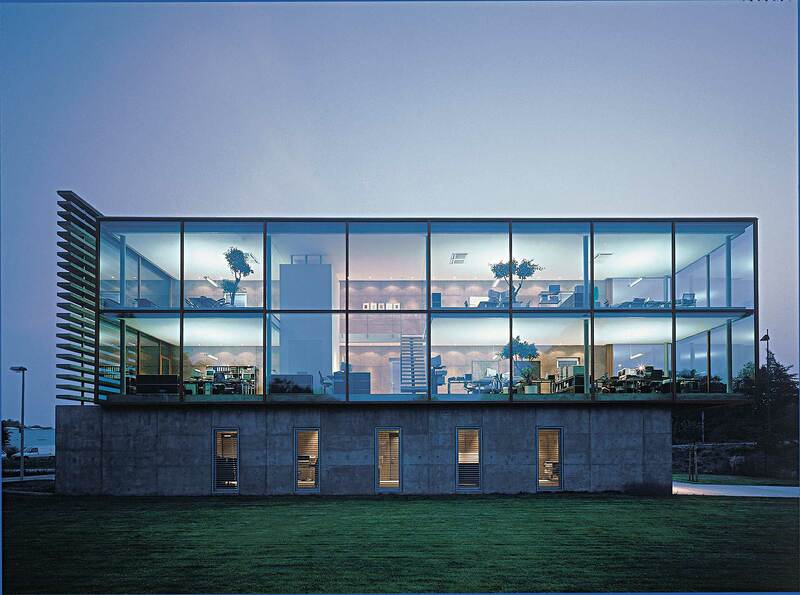 Frameless glass partitions are used to separate the zones. Only sanitary installations and the tearoom form an independent block. 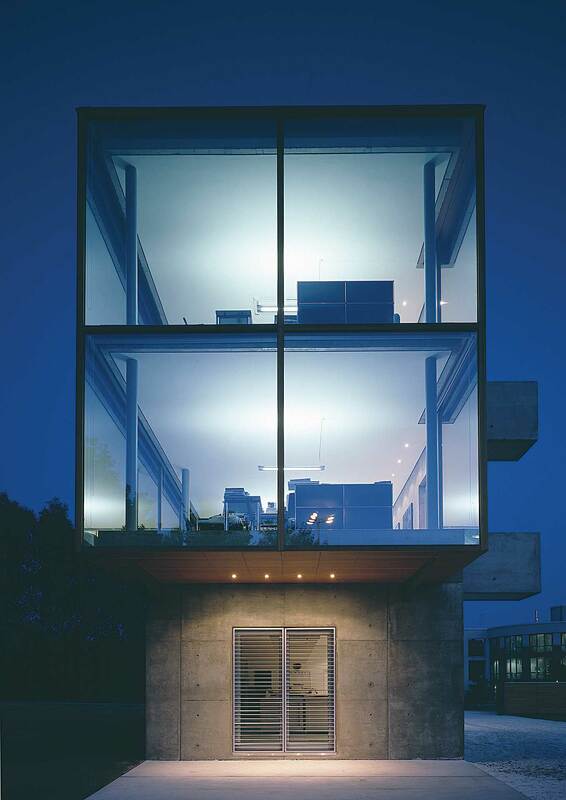 Stepping out is possible on each floor: balconies are arranged along the large concrete slab. 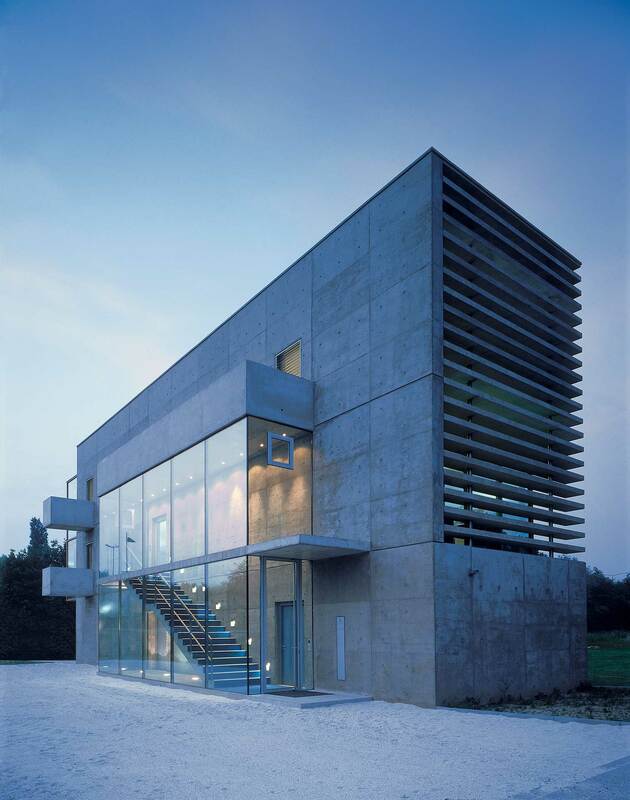 The construction selected for the external concrete walls was realized in Germany for the first time. The walls have been designed as double wall with internal bearing layer made of 17 cm reinforced concrete. Concreting of the outside wall of 10 cm in width was carried out on site. 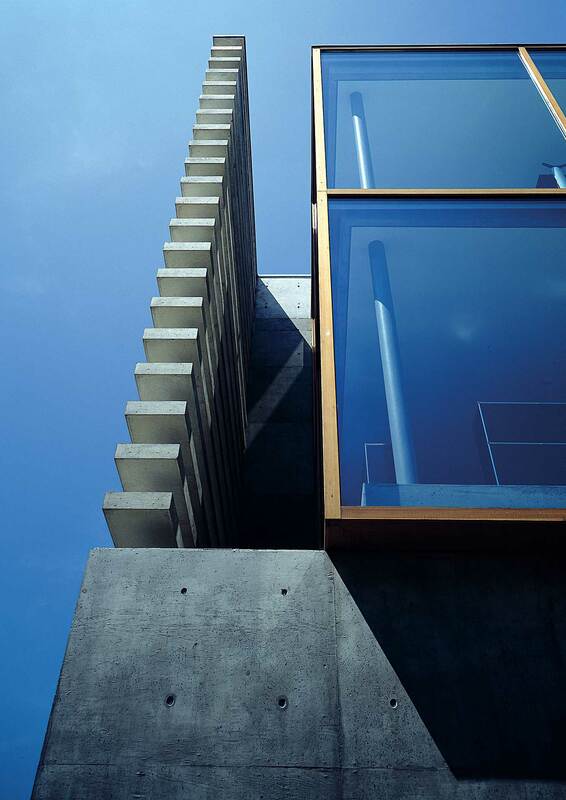 Only the concrete lamellas on the south of the building are made of prefabricated concrete elements. 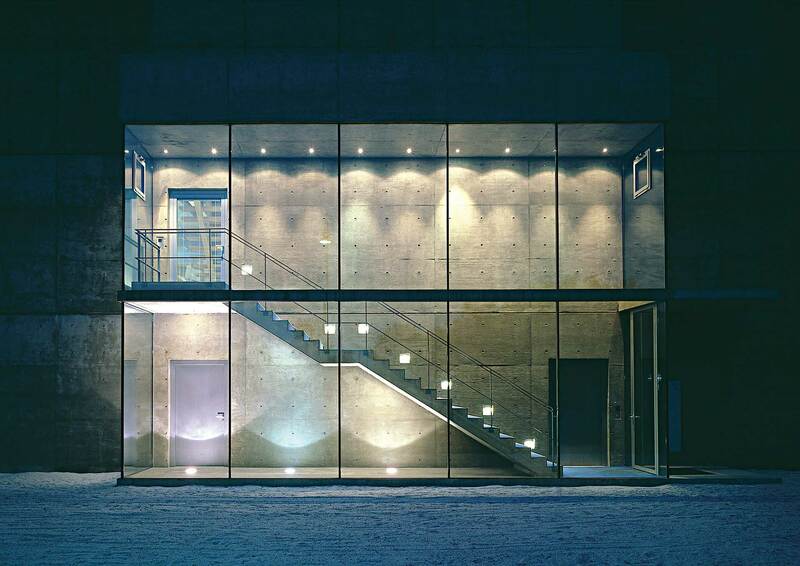 The airiness of the glass façades stands out against the heavy concrete walls. The glass fields are about 3.40 m x 3.00 m in dimension integrated into a post-and-beam construction from larch without visible fasteners. 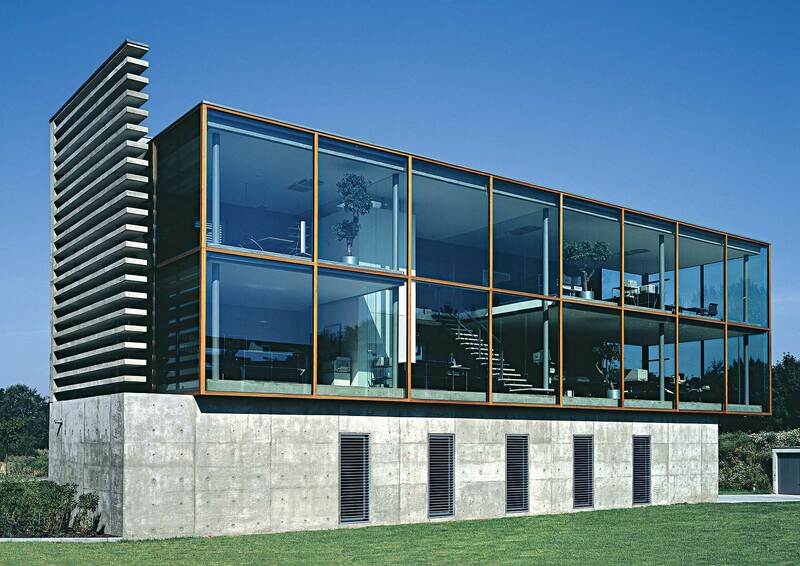 This type of façade design was planned and realized for the first time, as well. All walls, ceilings, as well as the circulation stairs inside of the building were also realized on site in fair-faced concrete quality. Primarily larch and steel combined with concrete have been used for further completion of the interior. Flooring in the production area on ground floor is a white epoxy resin. On the office floors, we laid a light, sandblasted Jurassic marble bordered near the façade by a circumferential concrete band of 10 cm in width.